With oil and gas prices falling throughout the quarter and taking a huge writedown for its Alaska operations, don't expect anything special from Shell's earnings report. While we don't know for certain what the company's profits will look like this quarter, chances are they won't be good. 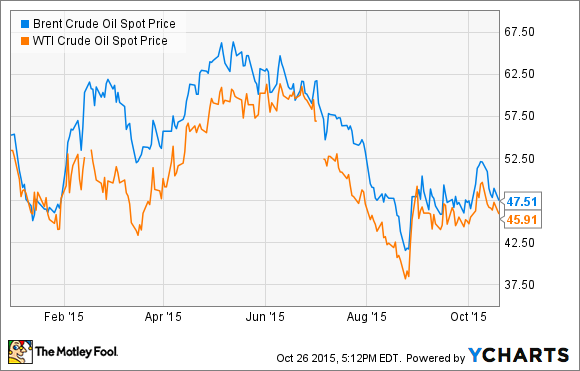 S&P Capital IQ estimates that Shell will report a normalized per share profit of $0.91. This same quarter last year, normalized EPS came in at $1.85. Of course, oil and gas prices are expected to be the driving factor behind the decline. 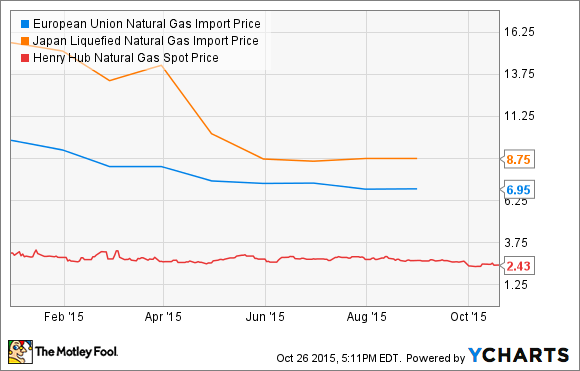 Average prices for natural gas across the world have remained low and oil prices declined from the second quarter. European Union Natural Gas Import Price data by YCharts. So far, earnings from upstream production are 83% less than the first half of last year. With even lower price realizations in the third quarter looming, it wouldn't be surprising if we see an even further decline. The only way that Shell will be able to meet these expectations is if its refining, chemical, and retail segments can pick up the slack. One component working in its favor is that the European Refining Margin Indicator -- a rough measure of refining profits -- is at the highest it has been in a decade. One of Shell's peers, France's Total (NYSE:TOT) saw some big benefits last quarter from high European refining margins and it's likely to see them again this quarter. Even if the company was able to eek out some profits from its combined segments, it may be all for naught. Chances are any profits this quarter will be wiped when the company writes down the value of its Arctic drilling program. Back in September, Shell announced that disappointing well results from drilling in the Chukchi Sea had resulted in the company suspending all Arctic drilling indefinitely. At the time, the company had spent about $7 billion on the Arctic adventure and was carrying more than $3 billion of that on the balance sheet as well as $1.1 billion in contractual commitments. Some analysts peg this quarter's writedowns in the $3-$3.5 billion range. Considering that Shell generated $3.2 billion in total profit in the first quarter and $3.8 billion in the second, a writedown of that size would likely wipe out any potential profits. The one silver lining on writedowns is that they are a noncash charge and won't drastically alter the company's cash flow. After all, most of the value it will write down is from cash that it already spent. Also, without the costs associated with the Arctic drilling program, it will free up $1 billion in annual capital expenditures that can either be dedicated elsewhere or cut outright. There are a lot of unanswered questions when it comes to Shell right now. The company is in the middle of a massive revision of its portfolio as it looks to divest up to $30 billion in assets between now and 2018. At the same time, it's looking to complete its integration of BG Group and the tens of billions of assets BG has. Shell calls this a "grow to simplify" approach that will eventually lead to a combined company that pulls in somewhere between $55 billion and $70 billion in cash from operations annually. Chances are, though, that we won't see too much headway toward that goal in the coming quarter. The one thing worth keeping track of this quarter, though, is how much the company has cut operational costs. CFO Simon Henry stated that the company had already cut $4 billion from its cost structure last quarter, and any more progress on that end will help this quarter and in the future. Shell reports its third-quarter earnings before the market opens on Oct. 29 and will host a conference call to discuss those earnings at 9:30 a.m. EST.